Give me one example of something in the universe that reflects perfectly well these 3 elements of the trinity: Yes, the sun! We are all, in essence, sons and daughters of the sun for we hold the same 3 elements: an intellect, a heart and a willpower each one of these with their psychic and spiritual correspondances: of light/wisdom, warmth/love and life/truth! In the past, this trinity was developed as a triangle pointing up representing the desire to reach up to God, developing in isolation like the hermits, monk and nuns. Often negating the body and its needs, or even despising the earth. In the Aquarian Age, this trinity must be inverted i.e. the triangle pointing down which represents bringing Heaven on Earth by putting all the aspects of ourselves in perfect balance and harmony and become living/walking models. Law of Karma, which is the law of action/reaction. It is the law of agriculture: you sow potatoes, you reep potatoes. That law rules all of Mother Nature. It is the law of divine justice. Law of Reincarnation: what you bind yourself to on Earth must be unbound on earth. The Teaching of OMA are essentially an oral teaching based on 78 years of conferences which have been compiled mainly into 2 collections of books: theComplete Worksand the Izvor collection, (the pocket book edition). There are some 80 titles, published in more than 32 languages. All the work done for the publishing of the books and for the organizing of the congresses throughout the world is done by the disciples themselves. There are no PR or marketing agencies. In the next issue, we will review some of these methods and exercices. Stay tune again! Co-ordinator of The Aquarian Team. What is Initiatic Science? It is the body of knowledge acquired by the great Initiates and Masters through the ages revealed to them by the Invisible world to help mankind in its development. This science, or body of knowledge, was taught to few and carefully selected students who demonstrated a strong psyche and disinterested nature. It was considered both sacred and secret and the disciples had to undergo trials and tests to prove their worthiness. It passed through Atlantis, Egypt, India, Tibet and became more popular under Esoteric Science in the modern age. Some of the Initiates and Masters include Moses, Rama, Krishna, Plato, Orpheus, Buddha, Hermes Trismegistus, Pythagoras, Jesus and many more. These teachings are based on essential truths. Truths which are immutable and stable as they are close to Spirit.These essential truths are called Principles and laws. Laws that apply to both: to the realm of nature and to the human psyche. What changes in the course of time is the application and methods, which are closer to matter and need to be adapted for each epoch. Example: Old Testament, eye for eye and tooth for tooth / New Testament, love each other. At this epoch, humanity is sufficiently developed for this science to be revealed and assimilated by the many. The Teaching of Omraam Mikhael Aivanhov encompasses, synthesizes and adapts that knowledge for contemporary living. As we approach the Aquarian age, we stand at a crossroad where humanity needs the most prepared and advanced to bridge the old age, Piscean age to the new Aquarian Age. The Aquarian Age is a spiritual age, an age of collectivity, of integrating the different aspects of oneself so we become whole. The term “Initiatic Science” derives from the Teachings of Omraam Mikhael Aivanhov. It has been recognized by to the Initiates and great Masters that their inspiration and knowledge came from the invisible world and was linked to a greater hierarchy known as “The Universal White Brotherhood”. The invisible family of great souls who work together to do the will of God and to help humanity in its evolution towards perfection. Aivanhov founded his movement under that same name and was clear to explain that, here on Earth; we were only a small branch office of the great one on high. Mikhael Aivanhov was born in Bulgaria in January 1900. He studied under a spiritual Master, Peter Deunov, who had returned to Bulgaria after completing his medical studies in America. Just before the 2nd World War, Deunov counted over 40,000 disciples and, sensing the political unrest, sent his best disciple, Mikhael Aivanhov, to France to insure to survival of his teachings. Aivanhov had become a disciple of Deunov while he was still in his teens. He studied several disciplines at university and at the time he was sent to France, he was principal of a school. He received the honorific title of OMRAAM while in India in the 1950 after meeting the sage BABAJI and which means Solve & Coagula. Aivanhov was on a one-year trip in India and when he returned to France, he had grown white and his disciples, noticing the change that took place, started calling him Master. Next month, we will pursue this subject with the 4 great sciences of the Initiates. Stay tune! As mentioned in previous January issues, the first 12 days of the year represent the entire year, the 1st being January, the 2nd February and so forth. So, if you pay attention to the way you live during the first 12 days, you will find the link to each corresponding month. You might even like to keep a diary of how your day enfolded, not only with events and people you met but also with your thoughts, feelings and actions. Later on, as each month goes by, you can verify the correspondence between the notes you took in your diary and the month itself. All this to say is being aware, conscious, of where we stand within, is what determines the next moment because only in each present moment can we improve the next moment. As students of life, the greatest responsibility we have is to become aware so we can choose the course of life and eventually we truly become the master of our destiny. Wishing each and everyone of you many blessings filled with harmony, beauty and inspiration. Already December, the Christmas month. Whether you live in the Northern or Southern hemisphere, the celebration of the birth of Christ is more symbolic than seasonal. Although, from a geographic point of view, it made sense that it was attributed around the winter solstice, time of the year when darkness is at its most dominant and when we stay more indoor, draw within. From an initiatic point of view, which is beyond geography, the birth of Christ represents a profound inner work where we are invited to go deep within our own being, through the darkness, to find the light of our own Christ child. It is good to remember that Christ is not a being but a state of consciousness. Jesus was the wonderful man and great initiate who was able to manifest the spirit of Christ. He was not born Christ, he was born Jesus, but through several initiations and inner work, he embodied for his last three years that state of consciousness that the Christ light is all about. It is reported in the Gospel of John versus 14:12 that whoever believed in Him [the Christ] will also do the works that he did and even greater works. It means that the Christ light is also accessible to every one of us. In our first book, What the Future of Humanity could be, we mention in the chapter entitled Science, Conscience and Superconsciousness this subject. Here is an extract that is most appropriate for this time of the year. Contemporary science agreed a long time ago that we only use a small fraction of our full potential. What is this full potential they are referring to? It is certainly not the capacity for more brain power. It is said that Einstein developed his capacity to 10 percent; if that is the case, most of us are well below that. Imagine what we could achieve if we developed our capacity to its full potential—to 100 percent. According to the point of view of initiatic science, this full potential comes from the superconsciousness, from this inner being, this inner spark, this profound spring, our Higher Self, where everything comes from. This source is often referred to as the fountain of youth or the philosopher’s stone. Superconsciousness is, in fact, the Second Birth, Self-realization, the Christ consciousness! Superconsciousness does not emerge from the intellect but manifests through other faculties that are more subtle and sensitive, such as the intuition that lives in the soul and spirit. Our full potential is the superconsciousness; it is, in fact, the Christ within! On behalf of the entire team, we wish you all a happy Christ birthing. In the Catholic religion, the month of November is entirely devoted to the deceased and praying for the souls of the departed one as well as all Saints. For those of us, in the Norther Hemisphere, it gets darker sooner every day and nature goes dormant clothed in drab colors waiting for its white blanket to brighten up the days. Also, outdoor activities slow down and we stay indoor longer. It is also a good time to go within. To take stock of where we are at. The first stage of death is discontentment. If you are not careful, discontentment can turn into displeasure, and displeasure in turn becomes unhappiness. In the same way, unhappiness becomes pain, and pain can become physical. Physical pain becomes illness and leads to death. A great deal of distress, regret and remorse accompany each of these stages. This extract was taken from the website of the Universal White Brotherhood.org in the section : Laws of Affinity. The books by Omraam Mikhaël Aïvanhov are published by Prosveta and are available through Amazon. Everyone knows the importance of eating to sustain our energy and health yet how do people eat most of the time? While talking, in a hurry and even sometimes while arguing which poisons their food. Of course, what we eat is important such as living ingredients which bring more life than dead ingredients. Have you noticed that when you are very hungry, only a few mouthfuls make you feel better already! That is because of the vitality of the food which is extracted by our most important laboratory: the mouth sends a feeling of satisfaction to our physical body. Indeed, the mouth possesses some glands that extract the subtle etheric particles from the food and makes us feel revitalized whereas the grosser particles go to the second laboratory, the stomach to process them. How to feed to subtle bodies to get the most benefits? In order to feel more strength, joy and inspiration in our daily life, the practice of Yoga of Nutrition tells us to eat with concentration, in a peaceful ambiance, starting with a blessing over the food so our body vibrates in harmony with it. Then to nourish our astral body, the body of emotion, it is suggested that we feel gratitude for the food that Mother Nature has prepared in her laboratories to sustain us. In return that gratitude will grow in our consciousness and feed the astral body. Then, to nourish the mental body, while concentrating on our food, we can reflect on all the influences the food has received from the cosmos: the sun, the moon, the rain, the warmth, the earth and so forth. In this way, our mental body is nourished through this form of meditation. Since we normally eat three times a day, it gives us an incredible opportunity to expand our consciousness strengthening our physical body as the food is processed in a nice vibration environment, nourishing our subtle bodies so we can go about our daily activities with peace, joy and inspiration! 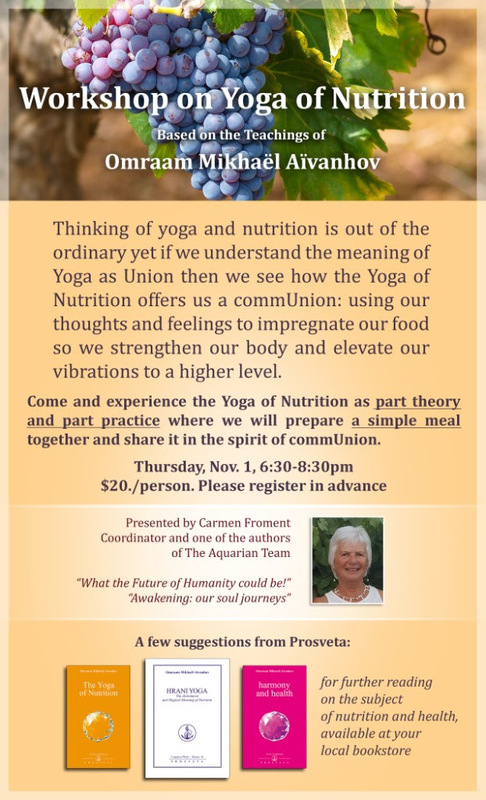 I will be hosting a workshop on Nov. 1 in the Toronto area with a theory part such explaining more about the Yoga of Nutrition and a practical part during which we will prepare the food and eat it together. This concept of the Yoga of Nutrition is presented in 2 books: the pocket book entitled The Yoga of Nutrition and a hard cover Hrani Yoga, the alchemical and magical meaning of nutrition. Both are by Omraam Mikhaël Aïvanhov and published by Prosveta. They are available through Amazon. If you are in the Toronto area, see the flyer below to join us. People have the impression that there is nothing they can do to help or improve humanity as a whole. The say: ‘There are just too many people; it’s an impossible task’. Yes, of course it is impossible; it is gigantic. But if you learned certain methods, you would see that, all of a sudden it had become possible. Most people fling nothing but criticism and abuse at those who bear the burden of government. In fact, in order to amuse the public, newspapers, cabarets and reviews make a point of laughing at political leaders and making them look ridiculous. The result is that these unfortunate leaders are influenced by such a burden of negative, wounding thoughts that they adopt the wrong policies for the country and, of course, the whole population suffers for their mistakes. If you want to help your country, you must touch the person in charge with thoughts of light so that he/she may always be well inspired. You cannot help a whole country, it is too big, but it is enough to help one person, just one. That is much easier. And he/she, in turn will help everybody else, for much depends on that one person. If he/she can promote just laws in the areas of public health, housing and education, the whole population will benefit, all because one person was well inspired! Try to imagine, for instance, that the whole of mankind is condensed into a single being standing there, by your side, and you hold that person’s hand to give quantities of light and love. When you do this, some minute particles go out from your soul, and the love you give this one being reflects on all people and they begin to conceive nobler thoughts and desires in their heart. If hundreds and thousands of people on earth did this exercise, you would see the breath of a new, divine spirit in all people and, without knowing how or why, they would wake up one day to find themselves completely transformed. Issue #64 - Children books based on kindness! The Master’s teachings came into my life about fifty years ago. Friends, who knew the difference between what is true and what is not, had come upon Omraam Mikhael Aivanhov’s books while visiting France from the US. They knew immediately that this was a great Master and what he said in those books was true. Although these friends are no longer here, the influence of this Teaching, through them and through the Master’s books, lives with me and seems to influence everything I do. What I do now is write and illustrate children’s books. I hadn’t planned on writing children’s books, however times change. With the closing of my galleries and messages received in dreams, children’s books became my next adventure. Never knowing where a story will take me, I just write along and see where it goes. Usually, I’m quite surprised at the outcome. The Master’s Teaching seems to find its way into these stories. A Mermaid Tea Party passes on the essential idea of never offering another an empty teacup, sand pail, or anything. And also, that by adding “loving kindness” to any occasion, even to a tea party, you can make a party out of it. Let’s Everybody Fish! explains the benefits of a collective effort. Mindful eating is demonstrated in One Green Omelet, Please! as a little girl in a noisy restaurant contemplates her plate of food by imaging all the efforts made by people, nature and the sun that goes into her delicious green omelet, and she is thankful. In most cases, I do not pick a subject and then write about it. But in the case of Mr. Getaway and the Sunshiners I wanted to suggest the benefits of contemplating the sun at sunrise. In this book, a group of children are taken on a field trip to the land of the Sunshiners and return with an appreciation of this practice. I have done several books to give military families techniques to help alleviate the sadness these children experience upon their parent’s deployment. The princess books in my collection (An Ordinary Princess, The Princess in My Teacup, and Better than a Princess) all emphasize self-worth and useful behavior – helpfulness, sharing, working together, and kindness. Kindness is an underlying theme; it seems, in all the books, as I look over the list. Meeting the mayor of Anaheim, California was a great honor. Mayor Tate had run on a platform of kindness… and won! His administration implemented a culture of kindness throughout the city, including the school system. The results throughout the city have been hugely successful. Every year the school children perform one million acts of kindness. The Monkeys Who Tried Kindness was written for the mayor and those children and captures the importance of this quality… and all in rhyme. This realization has prompted me to continue my work by creating these books. At the present time, there are over 100 books in the collection (70 stories, over 30 in a multicultural version, and 6 translated into Spanish.) Many of these books are in rhyme and all carry with them some of the essence from the Master’s Teachings. I am forever grateful for the opportunity to be useful in such a worthwhile way. Everyone is here to be useful. Sally Huss, one of our authors in our 2nd book, Awakening, our soul journeys. at does this mean? Let’s begin with the principles that Jesus brought. With his coming came many changes from the current beliefs which were based on the Old Testament: “An eye for an eye and a tooth for a tooth” and Jesus recommended turning the other cheek; loving thyself and thy neighbor. He presented God as a Father instead of revengeful Being. So he went above and beyond the teachings of his time. That is why he was rejected by the religious powers and was crucified. Yet, he brought new principles, that of love, compassion, understanding. Moreover, he said “I am the Light” and “He that believes in me, the works that I do, shall he do also and greater works than these shall he do because I go unto my Father.” So he also brought a new wisdom, a new light: the Christ principle. Christ is not a person but a state of consciousness where love and wisdom is the foundation which is available to each one of us to develop, to nurture and to become one with. As for the methods, Peter Deunov who was raised in an orthodox faith (his father was a priest), pursued his studies in theology in Bulgaria and in Boston where he also studied medicine. Upon his return to Bulgaria he laid the foundation of his teaching by gradually creating forms that corresponded to new ideas: that of respecting nature, being vegetarian, attending sunrise, using music and movement to harmonize body, mind and spirit. Then in 1937, at the eve of WW1, he sent his disciple Mikhaël to France to preserve his teaching and to spread it to the Western world. Since 1938 the methods have been adapted and expanded to today’s current momentum of life throughout the world where Brotherhood centers have been created for the practice of those methods; where people are part of the world but think differently (no need to live in monasteries or convents to get closer to God); and where brothers and sisters work on their body, mind and spirit while also contributing to the upliftment of all humanity through their harmony and light work. This is my personal understanding of thestatement that Mikhaël will bring the manifestation.